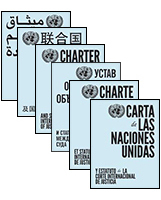 The Charter of the United Nations is the cornerstone of international peace and security. 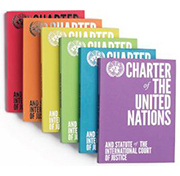 To commemorate the 70th Anniversary of the UN, the Charter is now available in two limited editions: a boxed set with multi-coloured covers and a boxed set with the Charter in six languages. These redesigned limited editions feature a new introduction titled 'From War to Peace', exclusive archival photos and the Statute of the International Court of Justice. The multicolour boxed set includes the English edition of the Charter in: violet, blue, green, yellow, orange and coral. Each colour is available to order individually, and as a boxed set with slip-cover. The multilingual boxed set includes the UN's six official languages: Arabic, Chinese, English, French, Russian and Spanish. Each language is available to order individually, and as a boxed set with slip-cover.